Target Earth Redux and the Surprise Appearance of the Evidently Rare Phrase, "Earth is My Target". This striking image is the cover of a pro-union pamphlet leveled at the Australian iron-producer, B.H.P. (Broken Hill Proprietary, a 150-year-old firm), and published in 1943 by the Federated Ironworkers' Association of Australia. The great social observer and artist Thomas Nast was very aware that much of his "readership" couldn't read, and so he made his work (which was usually text-heavy) completely understandable as a purely visual message. So too for artists like the anonymous person who contributed this great cover--there is no question about what might be in the pages of the pamphlet. It is also interesting to think about the "menacing" part of the title of this quick post--I would consider this still to be an early depiction of a robot (the term then still about a dozen years old) acting in a threatening manner towards humans--and in this case squeezing them until blood money is drawn. There is a very nice 13x19 inch 600 dpi poster being offered of this cover at the our POSTER Blog, here. The flying woman is striking, especially for the mid 18th century: she is quite lovely, muscular, and tall, and has her limbs attached to a flying/gliding canopy which seems as though it would be operated in a way in which the people of that time thought birds to fly. The associated image is Walter Hohmann's prescient work on rockets and rocket flight, Die Erreichbarkeit der Himmelskoerper, Untersuchungen ueber das Raumfahrtproblem, which was published in that great heyday of German flight engineering, in 1925. It was published very soon after the important work of Hermann Oberth2, whose style, illustration and design are closely aligned. It is very interesting to note here that Hohmann (and Oberth) both suggested using teh Earth's gravitational field to orbit the spacecraft and then slignshot it off into space, rather than to try to simply lift of from Earth and then go directly into space. 1. Biographical Dictionary of English Literature was not impressed by it saying: "The description of Nosmnbdsgrutt, the country of the flying people, is a dull imitation of Swift, and much else in the book is tedious. 2. Oberth's book, Die Rakete zu den Planetenraum was printed in 1923 by the same publisher as Hohmann, and was a cornerstone study of the issue of interplanetary space travel--the first of its kind, really, to address the full theoretical and practical aspects of rockets and space flight. Oberth--who wrote this at age 28--could not submit the work for his thesis because of its advanced treatment of a little-known subject. This series of drawings, published in the Illustrated London News 16 July 1938, by the incredibly prolific and detail-oriented G.H. Davies depicts one segment of the city defense program being formulated by the British government in the last year or two leading up to the beginning of the European end of World War Two. (I own 150 or so of these images by Davies--he never fails to provide the detail where you need it.) The overall plan for defending major British cities consisted of anti-aircraft guns, searchlights, R.A.F. fighter squadrons and interceptors, and the "Balloon Barrage". 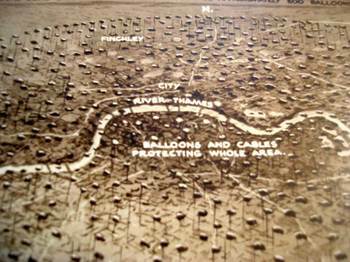 London and suburbs are featured here, all to be protected by a series of ten squadrons of fifty balloons each, handled by a crew of ten. The thinking was that it would make low-level bombing by fighter aircraft (?!) impossible, and force any aircraft attempting such an approach to a higher altitude where they would be theoretically susceptible to the interceptor squadrons. I'm not terribly sure why the thinking was against low altitude attack, but my best guess is that the planners were thinking about the He-111Bs and Ju52s or other such aircraft that the Nazis checked and tested out against the Spanish Republicans during the Civil War. Perhaps freshest of all memories of the German operation Feuerzauber (Magic Fire) was the Guernica raid, just a year or so before the publication of these images, where that militarily insignificant town was attacked from the air in twenty minute intervals over three hours, destroying it in a terror blitz. If I was sitting around a big table at 10 Downing, I’d have that picture in my head. .
Be that as it may, the "air mine field" looks terribly inefficient and vulnerable to me, sort of like an exposed Maginot Defense Line, but without the very deep misunderstandings that went along with the horrible French effort. 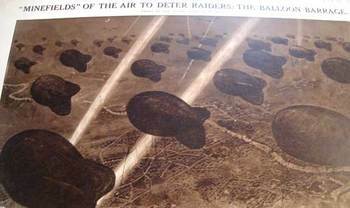 a) The first image shows the incredible perimeter defense network, which extended ten miles around St. Paul’s; the balloons were moored at 100 yard intervals, making for 1100 or so balloons to “fence” the perimeter. b) The second image shows London center and immediate suburbs, with another 500 balloons in a smaller circle inscribed in the larger. d) The last image is a close-up of London center. .
“Are not gross bodies and light convertible into one another, and may not bodies receive much of their activity from the particles of light which enter into their composition?” I. Newton, Opticks, 1704, Query 30. Depicting the capacity of sight and nature of light has been both an easy and a knotty problem in the history of science. Over the successive theories on the basis of light the artistic presentation of the phenomenon has been generalized (generally) in a very simple way: by straight lines. There’s certainly nothing wrong with that, the lines are just parenthetic place-holders suggesting direction, not actual descriptors of what light “looks” like. the lines of sight depicting binocular vision, observed (and compressed) by the eye's "particles" and processed by the pineal gland which in turn manipulate the "fluids" in the control of nerves and muscles. Another example of even greater fame than the iconic image by Descartes is that of the diagram showing the connection between color and its reflective index by Isaac Newton, appearing in his Opticae of 1706. Another fine example comes from Zacharias Traber's (1611-1679) beautifully illustrated classic of optics (and physiological optics) , Nervus Opticus sive Tractatus Theoricus..., published in Vienna in 1690. Traber is a great collector and synthesizer of the work done during and before his time, using the work of Descartes, Kepler, Schott, Kircher, Scheiner and Aguilon (for example), and then further implementing their ideas especially in the areas of color theory and light refraction. The image certainly reflects Jesuit Traber's religious training, depicting the holy source of light (originating with the almighty force) which directs it to the sun; the light then is left to the inquisitive and playful hands of cherubs who reflect and magnify it, as well as use it to start a fire (from the condensing lens) and observe it through a telescope. The main cherub empties a sack containing a number of different optical tools, no doubt for the playful brethern beneath. And then of course there is the great, unstoppable, polymathic and sometimes incorrect Jesuit Athanasius Kircher. This image appears in his masterwork Ars Magna lucis et umbrae, printed in Amsterdam in 1671, which deals with light and shadow, optical illusions, color, refraction, projection and distortion, sundials, mirrors, as well as astronomical subjects. Most of these subjects are clearly seen in the engraved frontispiece to the work (below), the source of all of the "rays" of light coming from the godhead, relayed through a telescope, reflected from a mirror, and gathered in a camera obscura. Other interesting images from the Kircher include this spotlight. The Depression didn’t stop professional theorists from working on the issue of what people should do with what was seen as the impending explosion of leisure time. Arthur Pack (The Challenge of Leisure, 1934) for example wondered about the impact of free-ish time and the implementation of “constructive leisure”. Walter Lippmann worried about the impact of “commercialized pleasures” rather than those that were creative and involving an idea. Still, in 1934, the ideas of leisure and pleasure as institutions were a distant, deeply fuzzy notion to most Americans. In 1935 the Depression in the U.S.(which started with the October Crash of 1929) had bottomed out, the worst of it all behind us (except for the recession of 1937). Industrial production was coming back (it had fallen about 45% by 1932), home building was making a rebound (coming around from an 80% drop in 1932 and after 274,000 people had been evicted in 1933), the bank failures had stabilized (having reached about a 40% failure rate in 1933), and the unemployment rate had “fallen” to 20% (following a 3% rate in 1929 and a 25% high in 1934). In 1932 the corporate profit rate had dropped 90% as had the value of the stock market, industrial production was off by about half, immigration had fallen to one-tenth of its 1929 figures, and over two million people were roaming around the country, forced from farms or homes, seeking destiny in trucks loaded with all of their possessions, walking, or riding the rails. But that doesn’t mean that the other segments of the American economy, those happy and personally unaffected in the Depression, couldn’t remain so: there was money and money to be spent, and spent well in the dwindling power of the mid 1930’s dollar, the purchasing power of the wealthy growing as the economy declined. Which brings us to this pamphlet for Flaming-Arrow dude ranch and the kids outfitted in the high, big-chaps fashion of thin-lipped, vocabularily-challenged cowboy stars of the 30’s matinee. But by Neptune’s soggy trousers, the kid on the front cover just looks so wrong—historical placement and societal understanding aside. Kids were sent to Flaming-Arrow (“for the discriminating family”) near Bozeman to spend the summer in a “semi-military” fashion, comforted in fine cabins with first-class appointments, all for about $395 for eight weeks. That figure would have been out of reach for a great majority of Americans (the average income at this point for a family having fallen to about $1500 a year), costing about a quarter of all family yearly money. I’m not so sure why this cover is so disturbing to me—maybe it is just something so simple as the war between the enjoyed leisure time of people with money and the enforced unpleasant leisure time of the unemployed and unmonied.